You’d have thought by now we’d be used to it. It happens all the time. Welcome to the machine. In a world forever set in flux, players will come and players will go. You may well have grown fond of them during their time, they may well have reciprocated the sentiment – but to expect anything other than a finite relationship is either futile and/or bewilderingly naive. All things must come to pass, and believe me, a player passing through your football club is among life’s more trivial losses. When the departed speaks of his profound love for your club, your adoration and your support – though he may be on the very verge of walking out the door, his words likely aren’t duplicitous. The heart and the road are two very separate entities. Pretend not to hear the ubiquitous ‘in search of trophies’ spiel, the crass talk of ‘differences in vision’ for they are mere mechanisms of change. Instead, take a crumb of solace in the fact that he likely means what he says about his gratitiude to you and your ilk. In time, his regard will hopefully become apparent. Remember, the pain will ease once the next hero comes along – and he too, one day, will leave. Fin de siécle. Don’t begrudge these men for what they do. They don’t play for your benefit. Never have, never will. The kidology is your doing and your doing alone. Just don’t get overly attached and you’ll be fine. Enjoy and rejoice with them the brief scintilla they spend in your life, all the while protecting yourself and your frail heart by affording yourself some distance. Then, when the time comes and love lies bleeding in an agent’s pocket, find it within yourself to thank them for their noble service to your club’s cause and wish them well on their travels. They usually deserve at least that much. Jeez Louise!! Would have thought Arsenal fans would be used to this sort of thing, it has happened to the EVERY SUMMER for the past 8 years or so!! And well before City started to monopolise the Arsenal production line of over rated mercs! Don’t believe me? Vieira, Cole, Henry, Flamini all left and none went to city. My money is on Young Jack being the next one to jump ship next season. Dear me this article is possibly the most self indulgent and dictionary swallowing attempt to appear as one of footballs great philosophers i have read. And im not even a bitter and childish Arsenal fan trying to poo poo any anti gooner articles and put the ‘im glad he’s leaving’ pretense on. As much as i appreciate the valuable life lesson in not growing too attached to ultimatly matters, i think you have only served to waste peoples time with such wannabe philosophical drivel. Im sure the call from the telegraph will come one day, but until then, please cut out this crap because its usually pretty funny on here. @Ben: That was kind of the point. Oh well. @adwew and Erm: These are surely the exceptions that prove the rule though, no? I’m not saying unfaltering loyalty doesn’t exist, more that you really shouldn’t be surprised when it doesn’t. Shearer, there’s another. Probably at the height of his career left Blackburn for…Newcastle. I don’t know if that’s good or bad. Maybe he actually thought he could help them win something, maybe he just wanted to play for his boyhood club, whether they were in the Premier League or League 2. I suppose you could say he was a bottler, not going to a big club to prove his worth on the biggest stages. @One England Captain: you used ‘Flamini’ to end that sentence. i see. @Wilma: He was their best player the season before he left. You say Del Piero, but look at the crowd that jumped off the boat when Juve got relegated (Cannavaro, Zambrotta, Ibra, Mutu, Vieira and Thuram). For every loyal player, there’s 10 “needing to make money while they can”. But there’s one BIG difference between Del Piero, Giggs and RvP: the first two are/were in title winning sides! Granted they don’t win it every year, but Juve and United are always serious contenders. Arsenal are always the “almost made it” team. Every great player wants to win titles. 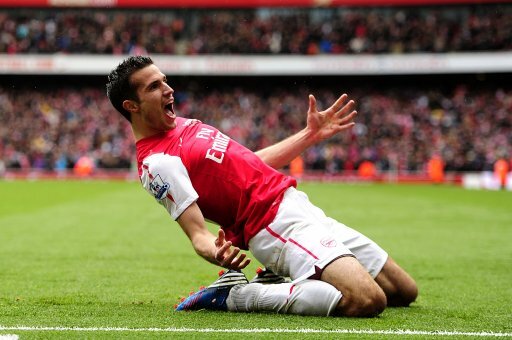 RvP IS a very good player (when not injured) and if Wenger insists on bringing youth (only to see them sod off a couple years later), I think it’s quite understandable RvP wants his shot at a bigger club, one that actually invests to be champion. isn’t the point basically, arsenal are now a selling club. Fans of buying clubs can get as attached as they want. I’m a fan of newcastle and we’re a selling club, despite finishing higher in the league and being better than liverpool, the chances are our top players will still want a move to anfield, where fans can get attached and it rarely ends badly for them. Learn to spell and properly punctuate before you rip someone else for what they have written. Great article Chris, my sentiments exactly. @Ben sigh, sigh, sigh. I thought your point was well said and well worth the saying. Funny? No, but then not every item posted on Pies has to be primarily for laughs. I liked reading this Chris, well done. remember ronaldo? we did just fine without him! I enjoyed this, being a Swans fan, I also needed it after the whole Brendan/Siggy ordeal. This is why you should support players and not clubs. My loyalty to Balotelli is strong and triumphant, and I know he will never disappoint me. In the words of that other great philosopher, Li’l Wayne: You can’t blame a ho for being a ho. RVP did the same thing to Feyenoord so why would you expect him not to do it to Arsenal? I enjoyed reading the article, Chris. After last season’s departures at Arsenal, I think I had lost faith in the good players really staying at clubs long term. Your article put this into perspective … I am not sure if anyone else feels this way, but I get exhausted (even before the season starts) with all of the speculation and transfer rumours. There has to be a better way to manage this process rather everyone being connected with every club and then only one person leaves – I know it is a lot of media speculation, but it makes me want to switch off until the season starts and THEN you can tell me who has come and gone. I’m not sure why you would want to refer anyone to this tripe. It would only get a C grade at GCSE level. It’s obviously written using someone else’s volcabulary. Needlessly pretentious and needlessly lengthy.